FAIRFIELD — By 11 a.m., before the first pitch had been thrown in Williamsport, Pa., just about every seat in the house was taken at Colony Grill. And by the time the game began between the Fairfield American boys of summer and the team from Texas, it was standing room only. The game, with the sound on, was on every television screen at the pizza parlor, owned by four men who helped Trumbull win the Little League World Series in 1989. Rather than their usual Colony tee shirts, the wait staff and bartenders sported the official maroon shirts for the New England representative at this year’s competition in Pennsylvania. 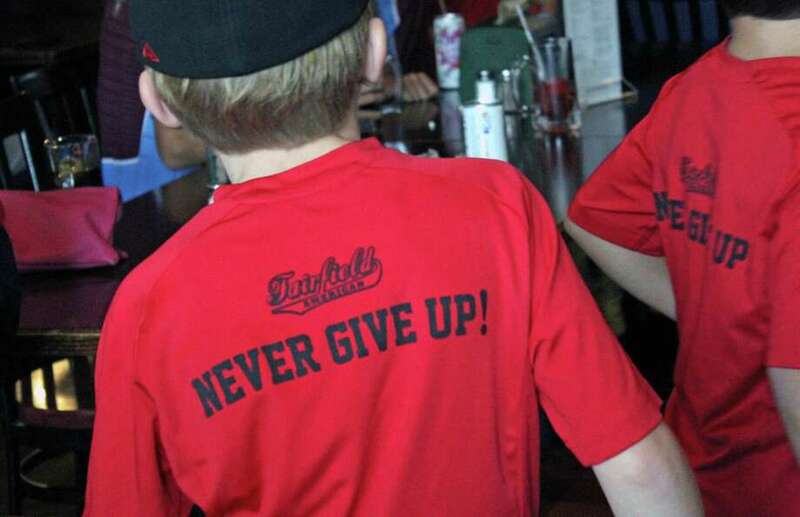 But you didn’t have to have your eye on the tv screen to tell how the game was going — every run, every strike out by a Fairfield pitcher, was greeted with loud cheers. Every misstep or run by the Texas team resulted in groans that were just as loud. Though Fairfield American was handed its first defeat after a string of 19 playoff wins, they’ll take the field again Monday at 8 p.m. against the winner of the Northwest region, the team from Walla Walla, Wash.
And Colony will be the place to watch, again —, just don’t wait too long if you want to get a seat. Fawver was enjoying the moment, however, and keeping an eye on the television. “It’s a really great community feeling,” she said.